Not every woman is born gifted in the kitchen department. Traditional recipe books take up far too much room, are impractical in the kitchen and lets face it, when you see a recipe written on a page it doesn’t make you salivate with hunger. So what does an attention challenged kitchenley inept woman like me need?? Could it possibly be an interactive digital cookbook. Belling are releasing the Media Chef, which comes loaded with 48 cook-along tutorials with chef Brian Turner who’s incidentally attempting to “bring back grannies’ recopies”. It has an 8″ screen and a compact remote control so you can play, pause rewind demonstrations so you’re not struggling to keep up. 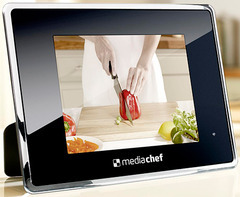 When you’re not using it to cook it can be used as a calender, digital photo frame or general media player. Price wise it’s around £179 but there’s no hints as to release date.